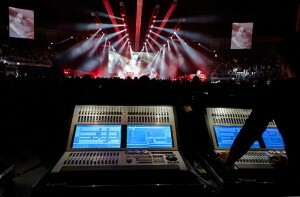 Avolites Media's Ai Media Server is delivering fast moving evocative visuals on The Script's sell out arena world tour. Conceived by award winning lighting designer Jamie Thompson, in collaboration with members of the band and creative London based content producers Immersive, the show visuals are operated by US based Jeffrey Brown. "The theme of '3' - reflecting the album and tour titles - was very important, and dictated much of the layout of LED fingers and stage graphics," says Thompson. "The Ai is being used to power a mixture of live camera feeds, video and visual content onto the main back video wall, and over the three, three-dimensional LED screens, which are embedded in the stage floor and run above the stage to reach into the audience like outstretched fingers. After witnessing the power of Ai at previous events, I knew we could create a stunning visual display for The Script, so I championed its use with the band and made it happen, and it was truly worthwhile - the results are fantastic." Visuals operator Jeffrey Brown continues: "The biggest benefit of using the Ai Media Server is that the content is easily built to fit the 3-dimensional model of our LED layout on stage. This model was then imported into the server and used as part of the interface to map the content to the LED screens. Its ability to map the video to the server's physical outputs as it is required is also pretty exciting. For this production, we mapped the overhead and stage fingers to a Nocturne LED Processor, while the main upstage video wall is mapped to another separate LED Processor. As the production developed, we also added pre-show content, which is played direct from the Ai Media Server." Mark Calvert, managing director for Immersive - the London based design company that produced and directed all of The Scripts digital content and who worked alongside Jeff Brown to setup the Ai elements for the show comments: "The band directly approached Immersive with only six week until the tour kicked off in Ireland. We were commissioned to make seven bespoke template specific videos, which were to be a defined and obvious mix between film, 3D and 2D disciplines." According to Calvert: "The Ai makes dealing with the 3D layout of the LED screen design a total breeze. It also means that significantly less time is spent mapping outputs on the road. This is vastly important (when on a pressured deadline) because Ai enables both our creative team and the guys in the band - to 3D visualize show content before rehearsals." 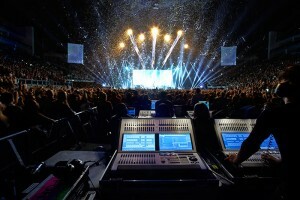 One of the significant reasons Immersive insists on using Ai throughout the design and show process is it's proven ability to adapt to ever changing Live Music environments as Calvert explains: "This was proven again on The Script, when the band (during the tour) wanted to add clip preferences, new media, and additional outputs on the fly. Working with Jeff was fantastic and he is now a key player in our US operations." Brown continues, commenting that the Ai is a "unique take on a media server", adding: "I discovered that I could manipulate the content on the model without worrying about how to map the individual clips. I believe the Ai Media Server has an excellent future ahead of it. Avolites Media is a responsive company and they listen to their customers. The Ai product is unique in the market. With the initial idea combined with positive industry feedback it has the potential to become the game changing piece of kit." Steve Warren, MD of Avolites Media enthuses: "Ai Media Servers were launched 18 months ago and already have been used to deliver some of the world's most impressive visual spectaculars. Ai Media Servers amazed the world with history's biggest ever video screen during the London Olympic Games Opening and Closing Ceremonies, we controlled the huge screens and projections for the Miss World finals as well as the stunning set on Sky 1's Got to Dance show. And we are incredibly proud to be working with Tait Technologies again for what we believe is the world's most complex moving mapping production: 52 moving set pieces on Bon Jovi's - 'Because We Can' Tour. "Jamie Thompson's innovative use of the screens on The Script's tour to again emphasise the strong 3 theme is ideally suited to Ai and it was a joy to experience the power of the visual effect. Everyone at Avolites Media is proud to be working with Jamie and with such a great talent and attitude - the only way is up!"